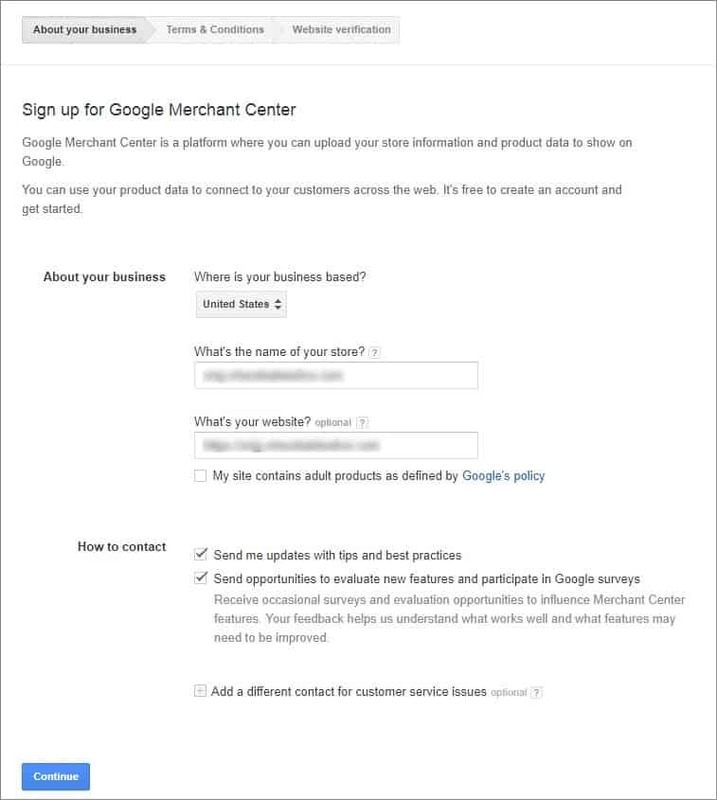 Google Merchant Center is a platform where you can upload your product data to Google and make it available for Shopping ads and other Google services. Being one of the greatest marketing solutions, Google Shopping campaigns attract potential buyers to your website and boost your conversions. 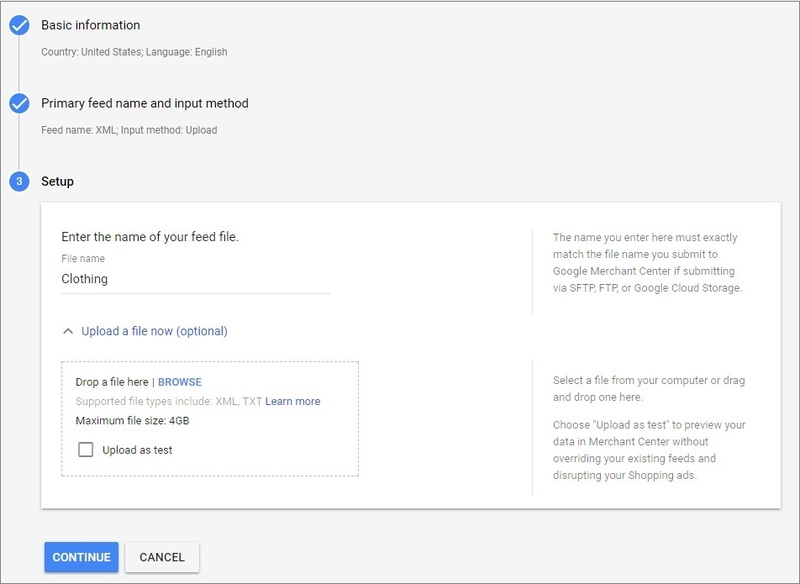 With the Google Merchant add-on, you can generate your product feed and upload your web store to Google. 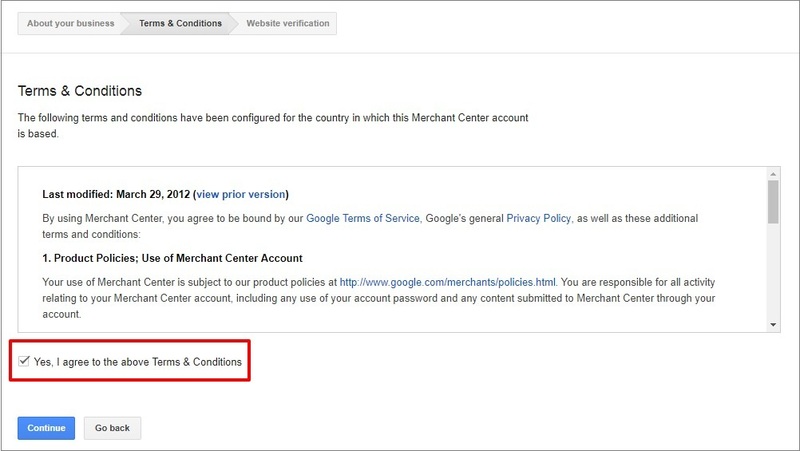 To get started, sign in to your Google Merchant account. If you do not have one, click Sign Up. Add your business details and click Continue. Check the box to agree to the Google Terms & Conditions. Verify your website URL by uploading the HTML file generated by Google to your website. 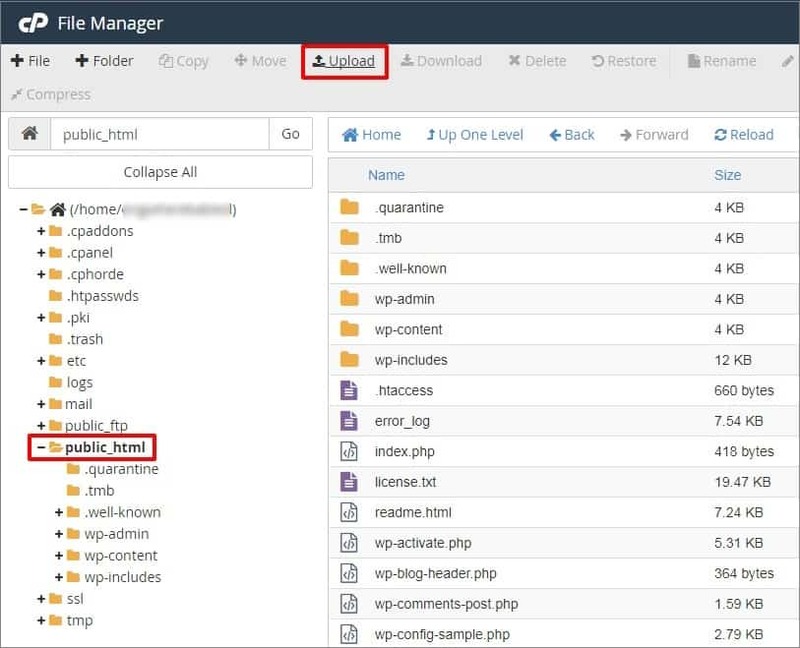 To upload the file, go to your cPanel => File Manager => public_html. Click Upload at the top of the page and upload the HTML file. 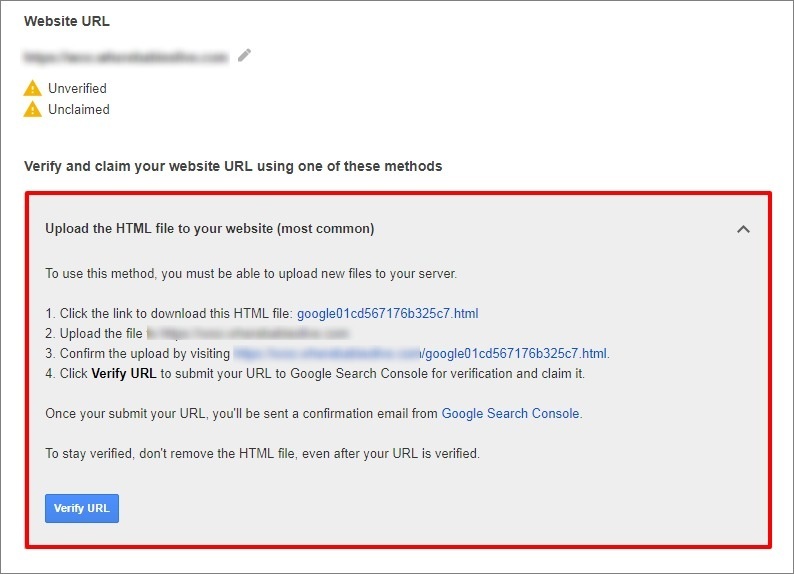 Confirm the upload by visiting the link provided by Google (Step 3) and click Verify URL. Do not delete the HTML file you have uploaded to your cPanel to stay verified. 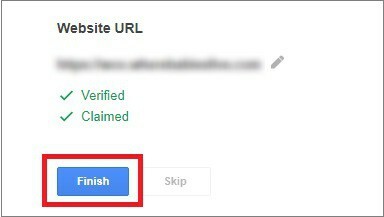 After your website URL has been verified and claimed, finish the setup by clicking the Finish button. You will be redirected to your GM Center. 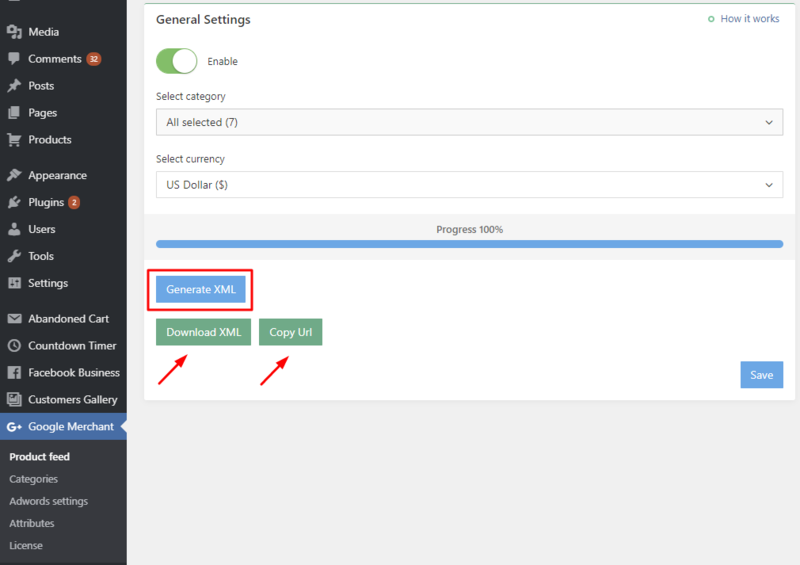 To install the add-on, go to the Plugins area => Add New and upload the zip file you have downloaded from the Thank you page or from the email you received after the purchase. Click Install. Activate your add-on and your license key. 3. 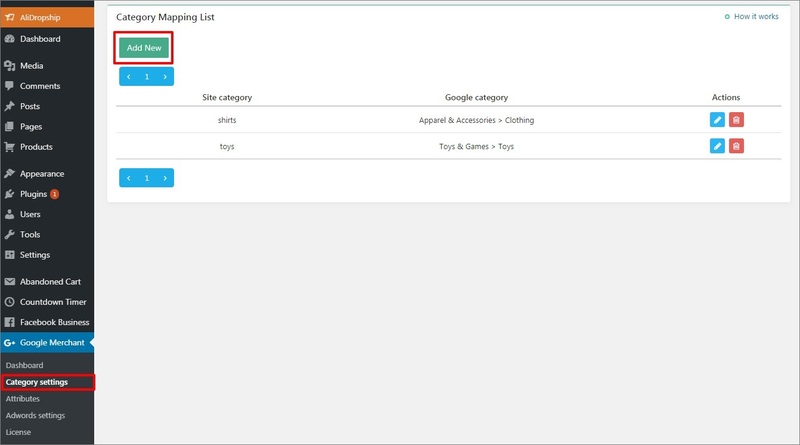 Match your products categories to relevant Google categories in the Category Settings tab. Click Add New to assign your website category to a relevant Google category, which best describes your product. In the pop-up, first choose your website category, then select a matching Google category from the dropdown menu. Click Save. 1. Global Trade Item Number (GTIN). This attribute should be provided in case you want to advertize books, medication, printer cartridges, etc. Check the full list here. 2. Manufacturer Part Number (MPN). This attribute should be provided in case you want to advertize electronics, food, beverages, etc. Check the full list here. 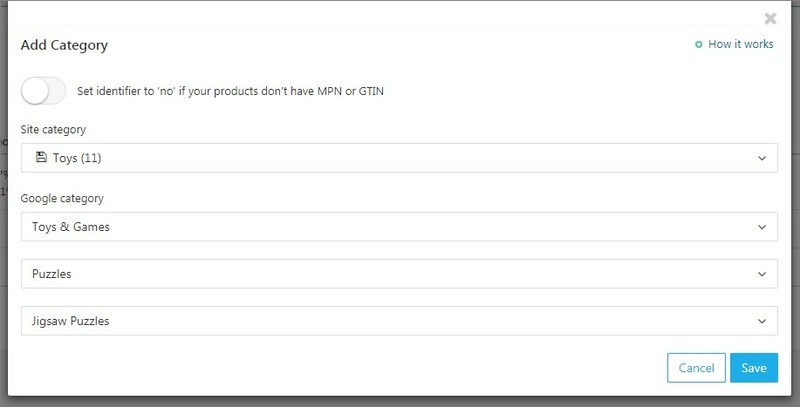 This information cannot be collected from AliExpress, so you should enable the 'Set identifier to 'NO' if your products don't have MPN or GTIN' option if you sell goods mentioned in the lists. 4. 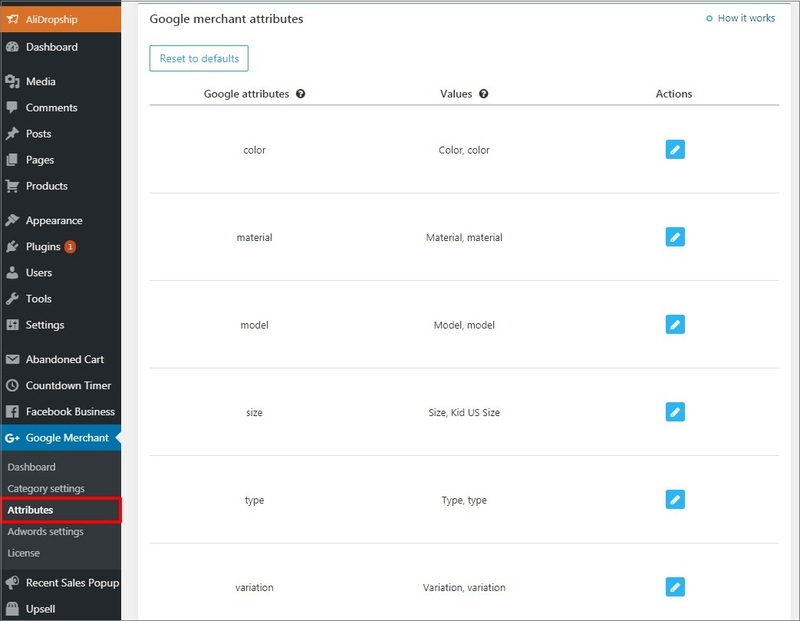 Check your product attributes in the Attributes tab. Google product category attributes indicate the category of your item based on the Google product requirements. Categorizing your products helps ensure that your ad is shown with the right search results. Google has a wide range of product data attributes. There are six of them, crucial to correct feed generation, available in the add-on. Fields in the Values column (i.e. product attributes used on your website) are populated automatically. However, you might need to add some values manually if your product attributes come in a language that is different from English (for example, couleur, colore, Farbe, etc.). Click on the pencil icon to edit your product attributes. Use the Reset to defaults button to get back to the original values provided by the add-on. Attention! Your products must have at least one attribute. Required attributes may vary from category to category, please check Google product feed specification to learn more. Feed cannot be generated for simple products (i.e. products that do not have any variations). You must manage Shipping and Taxes – another two required attributes – in your GM Center. 5. Enable the add-on in Dashboard. To enable the add-on and adjust your general settings, go to Product feed. Enable the toggle switch and click Save. 6. Choose feed generation method. a) You can download your XML file by clicking Download XML. b) You can copy URL of your feed by clicking Copy URL . You will be able to schedule updates to your feed automatically without uploading XML files. 7. Choose categories to include in your feed. Select a category/categories you want to generate your feed for. 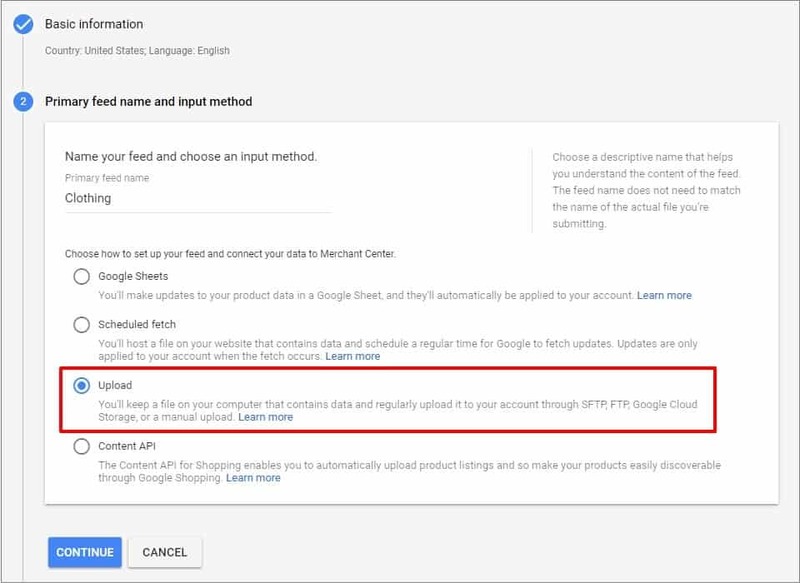 Please make sure your product categories match Google requirements (check the Category Settings paragraph set out below). Submitting your product data to Google in the right format is very important for creating successful ads. Select currency to be shown in your Google Shopping ads. Click Generate XML file. Once the progress bar has shown 100%, proceed with the download by clicking the green button Download XML file. Also, you can click Copy URL in order to paste it in your GM Center. To add the feed you have generated in the add-on, go to Products => Feeds and click on the “+” button. 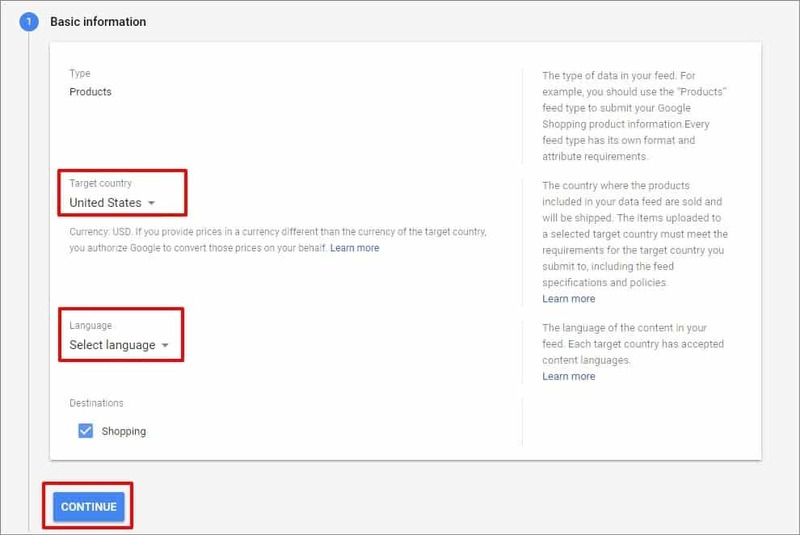 Select your target country (where your products will be sold and shipped) and language (content language of your target country). Click Continue. 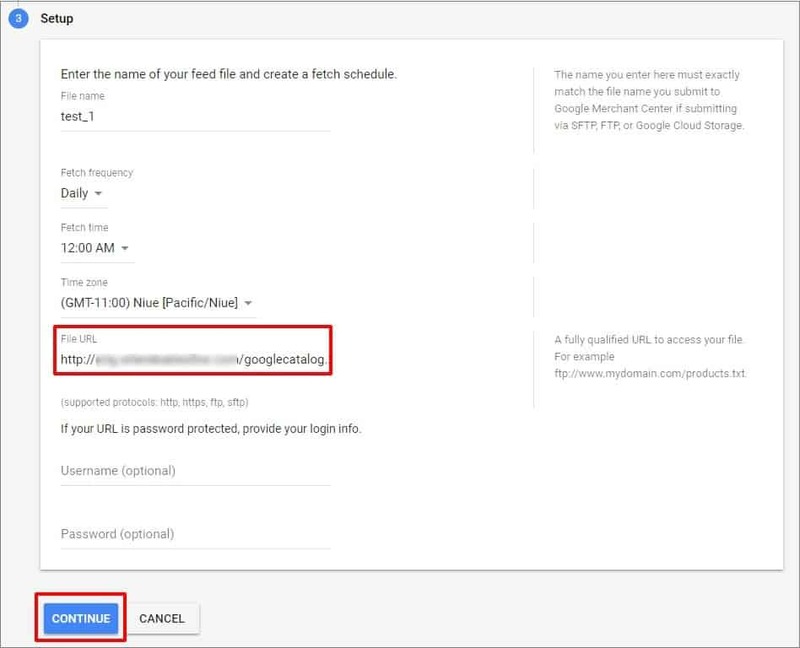 Paste URL of your XML file in the File URL field and set up fetch schedule. b) Upload (to update your product feed, you will need to generate XML file every time you want to update your feed). Give your feed a name and upload the XML file from the add-on. 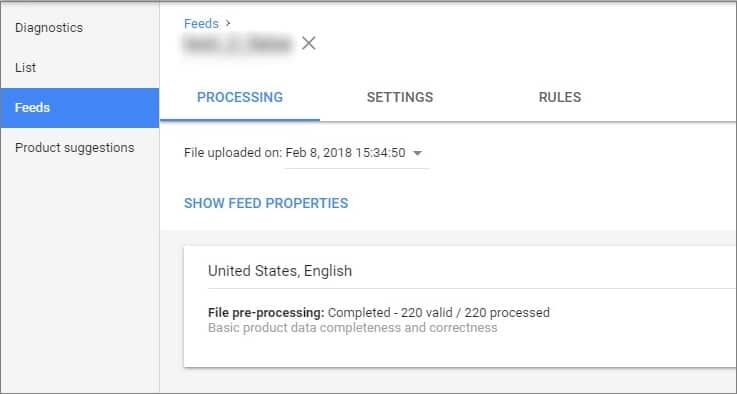 You will be able to check your products as soon as the feed is uploaded to your GM Center. It may take Google a few minutes to display your feed. Please refer to Google’s Beginners Guide in case you need further guidance. Shopping Campaigns for ads are created and monitored in Google Ads. Create a new Ads account or use your already existing Ads account and link it to your Merchant Center to set up your Shopping campaign. To link your GM Center to AdWords, go to the 3-dot icon menu and and then click Account linking. Select Ads and click Create account if you do not have one. Set the timezone and currency for your Ads account. Please note that you will not able to edit these settings later. Click Create. As soon as your account has been created and linked to your GM Center, you may create your first shopping campaign in Google Ads. To learn more, please check this Ads guide. To learn how to launch your Google Ads campaign and setup Adwords settings for Google Merchant add-on, please check this guide. Having troubles with your data feed? Check the list of common issues and how to resolve them here.